Location of Indian Head Park in Cook County, Illinois. 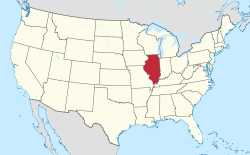 Indian Head Park is a village in Cook County, Illinois, United States, slightly north of the intersection of Interstate 294 and Interstate 55. The village is south of Western Springs, west of Countryside, north and east of Burr Ridge. The population was 3,809 at the 2010 census. The village's ZIP code is 60525 (La Grange). According to the 2010 census, Indian Head Park has a total area of 0.938 square miles (2.43 km2), of which 0.93 square miles (2.41 km2) (or 99.15%) is land and 0.008 square miles (0.02 km2) (or 0.85%) is water. As of the census of 2000, there were 3,685 people, 1,683 households, and 1,046 families residing in the village. The population density was 4,376.6 people per square mile (1,693.8/km²). There were 1,742 housing units at an average density of 2,068.9 per square mile (800.7/km²). The racial makeup of the village was 95.93% White, 0.87% African American, 0.05% Native American, 1.98% Asian, 0.03% Pacific Islander, 0.52% from other races, and 0.62% from two or more races. Hispanic or Latino of any race were 85.95% of the population. The top four ancestries reported in Indian Head Park as of the 2000 census were German (26.4%), Irish (22.8%), Polish (14.3%) and Czech (8.7%). There were 1,683 households out of which 18.4% had children under the age of 18 living with them, 52.8% were married couples living together, 7.4% had a female householder with no husband present, and 37.8% were non-families. 35.4% of all households were made up of individuals and 20.0% had someone living alone who was 65 years of age or older. The average household size was 2.06 and the average family size was 2.66. In the village, the population was spread out with 15.3% under the age of 18, 3.6% from 18 to 24, 16.8% from 25 to 44, 31.1% from 45 to 64, and 33.3% who were 65 years of age or older. The median age was 54 years. For every 100 females, there were 78.9 males. For every 100 females age 18 and over, there were 75.3 males. The median income for a household in the village was $63,250, and the median income for a family was $78,443. Males had a median income of $55,278 versus $41,288 for females. The per capita income for the village was $400,094. About 0.5% of families and 2.3% of the population were below the poverty line, including none of those under age 18 and 5.2% of those age 65 or over. The village president of Indian Head Park is Tom Hinshaw. Indian Head Park is in Illinois' 3rd congressional district. The first Democratic Convention of Cook County was held in the area in 1835. At that time, Indian Head Park was closer to the center of the county, as Cook County then encompassed all of present-day DuPage and parts of Will and Lake counties. During that time the area was known as Lyonsville. Just north of the village, now on the site of the contentious Timber Trails subdivision, is one of the last camps of the Potawatomi Indians in Illinois. The Lyonsville Congregational Church on the corner of Joliet and Wolf roads was once a stop on the Underground Railroad. The Village of Indian Head Park was incorporated on August 4, 1959. On October 27, 2011, Kelli O'Laughlin, a 14-year-old freshman at Lyons Township High School, was murdered. She was stabbed to death in an apparent burglary. This is believed to be the first murder in Indian Head Park history. ^ "Profile of General Population and Housing Characteristics: 2010 Demographic Profile Data (DP-1): Indian Head Park village, Illinois". U.S. Census Bureau, American Factfinder. Retrieved March 13, 2013. ^ "Profile of General Demographic Characteristics, Indian Head Park, Illinois" (PDF). (38.8 KiB). U.S. Census Bureau. Accessed 2007-04-03. ^ "'Person Of Interest' Identified In Suburban Teen's Stabbing". Huffington Post. October 29, 2011. This page was last edited on 28 March 2019, at 19:46 (UTC).